Professor Barima Azumah Nelson — he is the man. Learn from him Ghanaians, especially athletes. It is not ordinary to shower praises on a living person as being done to Azumah Nelson. No doubt, during one of the radio phone-in programmes, the man was so emotionally charged that he broke down and wept. In the past couple of weeks, the Ghanaian media had been filled with several write-ups and radio programmes, paying glowing tributes to one man, Professor Barima Azumah Nelson, on the occasion of his induction into the International Boxing Hall of Fame. To me, Azumah Nelson is the greatest phenomenon that happened to Ghana in contemporary times, serving as a unifying force for all Ghanaians: a perfect gentleman, humble, well disciplined and, above all, patriotic and humanitarian, a very rare breed in a sport noted for its chauvinistic tendencies and 'mafia' orientation. Every Ghanaian would agree with me that Azumah is an epitome of the above qualities, galvanized by steel determination, dedication and hard work. An achiever indeed and, no doubt, many testimonies made by noted personalities in international boxing attest to the fact that he is perhaps the greatest African boxer of all time. Now my major concern is after Azumah has left the ring, what will be the fate of boxing in the country? It is rather unfortunate that soon after his absence Ghana cannot boast of any world-class boxer. Is it because none possesses his qualities? In recent times we have witnessed at least five Ghanaian boxers who fought for various world titles performed abysmally and lost the ultimate. If we consider boxing as one sport, which has brought the nation glory and placed her on the world map, then something needs to be done urgently to arrest the downhill trend. I have to reiterate the call for young boxers aspiring to reach the ultimate in international boxing to emulate the boxing professor by imbibing all those qualities he is made of. I know the man will not cut himself off from the sport he loves so much. 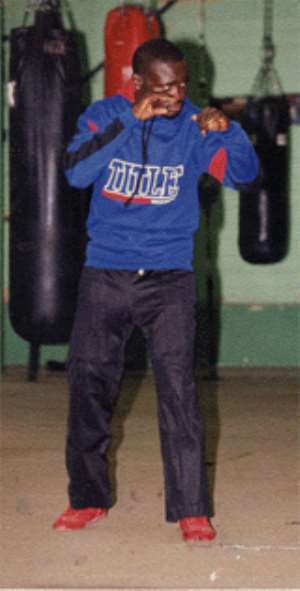 He will be just ready and willing to assist any serious young boxer who approaches him for help in that matter. To the professor, I say please accept my congratulation on your induction into the International Boxing Hall of Fame which you so deserve. All honour to those who worked for it. Indeed, you are the man. The nation is proud of you.